Psoriasis is a chronic, non-contagious, skin condition in which skin cells grow too quickly, resulting in thick, white or red patches of skin to form. Usually the skin cells grow gradually and flake off about every 4 weeks. As this occurs, new skin cells grow to replace the outer layers of skin as they shed. When an individual is afflicted with psoriasis, new skin cells move rapidly to the surface of the skin in days rather than weeks. This gives the appearance of the thick skin patches, or “plaques.” Plaques range in size, and most often appear on the knees, elbows, scalp, hands, feet, and lower back. Psoriasis can sometimes spread and lead to inflammation of the joints, which is referred to as psoriatic arthritis. 10-15% of people with psoriasis have psoriatic arthritis. Psoriasis is most common in adults, but can affect children as well. The exact cause of psoriasis is unknown, but most doctors believe it occurs when the immune system overacts, causing inflammation and flaking of the skin. There is currently no known cure for psoriasis. However, there are many available treatment options. Dr. Jay will help you determine which method is best for you. Treatment aims to slow the rapid growth of skin cells and reduce inflammation. Treatment for mild psoriasis, or only a few patches, is usually treated with over-the-counter creams, ointments and lotions to keep the skin moisturized. Mild psoriasis of the scalp can be treated with shampoos and oils. For more severe cases, or when over-the-counter products fail, topical medications such as vitamin D compounds, cortisteroids, anthralin or retinoids may be prescribed. Another availably treatment for psoriasis affecting less than 20% of the body, is phototherapy. During phototherapy, the affected areas are briefly exposed to intense ultraviolet A or B light (UVA, UVB). UVB treatment is completed 3 times a week, and when used in combination with medicine such as calcipotriene, is quite effective. Psoralen and UVA light therapy (PUVA) combines exposure to a chamber of UVA light with medication called psoralen to treat psoriasis. It must be completed for many weeks before symptoms will improve, but the results are generally better than UVB treatment. However, UVB treatment remains safer. When topical medications and phototherapy do not effectively treat moderate to severe psoriasis, oral medication may be prescribed. 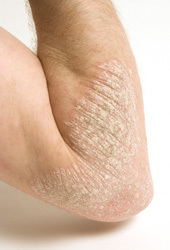 Methotrexate, retinoids, or cyclosporine are all used to treat psoriasis. However, these drugs can have serious side effects, such as weakening the immune system, and liver or kidney damage, which is why they are generally reserved for more severe cases. Biologics are medications similar to the proteins made by the body. They block the harmful response of the body’s immune system that causes psoriasis. Biologics are generally used for people who cannot use other treatment. They are generally as effective as other oral medications, but may have fewer side effects. However, the long-term safety of biologics is unknown. Therefore, for patients who require treatment their whole lives, Dr. Jay will likely recommend rotating or changing treatment periodically. Avoid extreme cold or dry climates. While cold weather can make psoriasis symptoms worse, sometimes heat and humidity can improve symptoms. Avoid scratching or picking skin. Avid infection. Strep throat in particular can cause psoriasis to appear suddenly, especially in children. Limit alcohol intake, and do not smoke. Alcohol use can cause symptoms to flare-up, and smoking may make psoriasis more severe, or cause the symptoms to last longer.